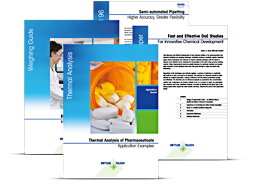 Find all the technical documentation you might need for METTLER TOLEDO products: datasheets, user manuals, certificates, technical reports, product brochures, installation and operating instructions. To get started, select your area of interest by product, industry or application and choose the document type you are looking for. You can also type in keywords and after selecting the document type find all the relevant materials. Looking for the resources on best practices, good measuring practices, global certification, safety standards? Go the Brochures, Webinars, Videos tab.